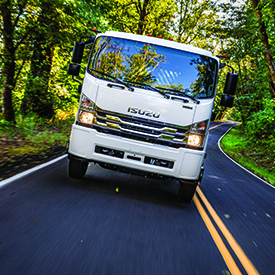 Isuzu’s FTR is a game changer, raising the standard for Class 6 medium duty trucks. The FTR is the LCF answer to Class 6 efficiency, delivering a lower cost of ownership. It comes equipped with a four-cylinder diesel engine that is built to last, with a B-10 rating of 375,000 miles, making it extremely fuel-efficient. It also offers 8 wheelbases that can accommodate bodies from 14 to 30 feet allowing for more cargo space, which means it has you covered, no matter what job you need it for.